Outline: Parable of the wedding feast in Matthew 22. Clear application. Several versions. 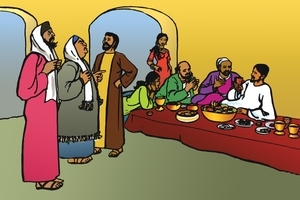 In the Bible Jesus tells us about a king who made a wedding feast for his son. In those days feasts of this kind were very rich and beautiful. The king himself provided beautiful wedding garments trimmed with jewels and gold. Everyone who came to the wedding feast had to put on one of these robes in order to get in. All the people in the land were invited. Every single person from the lowest to the highest could have the joy of seeing the king himself and sharing in the wonderful feast. The invitation was announced to everyone. "Come, the marriage supper is ready! All who will may come!" The guests arrived and the time came to go inside. The great door was opened and in went the guests. But there was one man who got inside the doors without a wedding garment. He must have thought his own clothes were good enough. Inside, everything was brilliantly lighted. All the garments sparkled and shone in the shining glory. Everyone was happy, except the man without the wedding garment, and he was miserable. His own clothes which he had been sure were fine enough to wear in the king's presence were now like dirty rags. As he gazed wretchedly upon them, his thoughts must have been like this: "I wish I had not been so proud and stubborn. Oh, if only I were wearing the beautiful wedding garment which my king offered to me instead of these horrible rags! But now, how terrible this is! I hope the king doesn't see me. It seems like everyone is looking straight at me. I feel naked." The king entered in glory and splendor. He looked right at the man without a wedding garment, and said, "Friend, how did you come in here without a wedding garment?" And the man was speechless. He had not one good excuse. He had stubbornly rejected the wedding garment. He knew the king's decree but he would not obey. He thought he was good enough, but now he had no covering for his sin. The king had him bound hand and foot and thrown into outer darkness where there is weeping and gnashing of teeth. God's Word says, "The wicked shall be cast into hell." Christ is going to return some day. We, too, will be in the presence of the great King. Our own goodness is but filthy rags in His sight. Have you been saved from your sin? In your own righteousness you cannot stand before a holy God. But Jesus Christ came to this earth and gave His life as a sacrifice for our sins. Jesus Christ will give you a robe of righteousness if you accept Him. Receive Him now. The blood of Jesus, God's Son, cleanses us from all sin. By believing and trusting in Him you too can be cleansed from your sin. GRN has recorded a version of this script in 130 languages and dialects. See full list.